According to the OKRs methodology, goals should be time-bound. Sessions represent the time period in which given group of Objectives is meant to be achieved. For example, if you are planning OKRs in quarters, then you could have a session called Q2 2019 which starts on April 1st 2019 and ends on June 30th 2019. 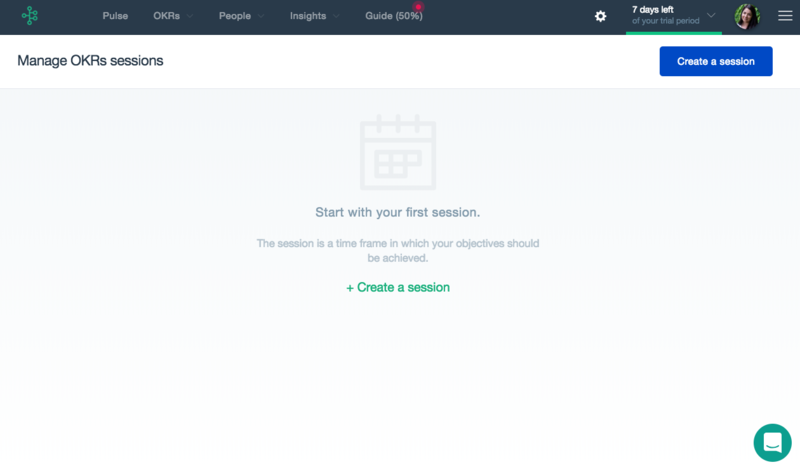 Open - when a session is open, users can add, edit and delete objectives and key results. This state is used when people are still defining, negotiating and planning OKRs for the upcoming period. In Progress - when a session is in progress, users can only update their progress on the key results. They are not allowed to add new objectives, remove existing ones or modify targets. This state is used once the OKRs are finalized. Archived - when a given session is archived, no more actions are possible on it or its objectives but it is kept for reference. In the modal window set a name to the session, specify the time period and click Create and go to the session button to move forward with creating your first OKR. Once your current OKR session is about to end, you may want to create a new one for the upcoming OKR period, e.g. next quarter. The process of creating new sessions repeats itself once every month, quarter or year. That depends on the company’s specific OKR cycle practices. Remember to always set a designated status and cadence to your session so that everyone follows the agreed OKR processes in your organization. Now that you have your session created, let's create objectives and key results that represent your company's goals for the chosen time period.